As the Children’s Health and Exercise Research Centre celebrates its 25th anniversary, its Director Professor Neil Armstrong reflects on what has been achieved – and how much is still to be done if we are to tackle rising levels of child obesity. The Children’s Health and Exercise Research Centre’s initial studies of 800 11 to 16-year-olds identified for the first time the prevalence of coronary risk factors in British children. Unhealthy levels of cholesterol in the blood and body fat were demonstrated but uniquely the findings characterised the fitness and physical activity patterns of children and adolescents. It was shown for the first time that many young people in the UK had adopted sedentary lifestyles; boys were generally more active than girls and physical activity declined through adolescence. When the findings were presented on BBC and ITN national television news on the day of publication in the British Medical Journal the media coined the phrase ‘couch potatoes’ to describe the phenomenon. These data predicted the current paediatric obesity epidemic. Further studies demonstrated gender differences in physical activity to be present as young as five years of age. A re-visit in 1999 to communities studied 10 years earlier provided the first indication that young people’s physical activity levels had stabilised at a sedentary level. Other research in this health-related area investigated physical activity in relation to diet, body fat, visceral fat, obesity, micro vascular function, psychological well-being, physical education, blindness, diabetes, heart rate variability, and cystic fibrosis. These aspects of the work and its implications for present and future health and wellbeing have been widely disseminated in the national and international press and featured in over 300 television and radio programmes. The increase in public awareness of the issues resulted in the data generating questions in both Houses of Parliament, the presentation of invited seminars to MPs in Westminster, private audiences with Ministers and with Prince Philip at Buckingham Palace. The impact of the research on children’s health and well-being was recognised in 1998 with the award of the Queen’s Anniversary Prize for Higher and Further Education. The Prize was the first to be awarded in paediatric sport and exercise medicine and the team had the honour of going to Buckingham Palace to receive the prize from HM the Queen who had shown great interest in the research when she visited the Centre with Prince Philip three years earlier. 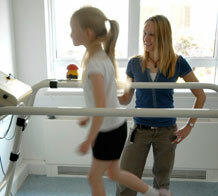 The initial studies in the 1980s raised numerous theoretical and methodological problems regarding the assessment and interpretation of young people’s responses to exercise in relation to age, maturation and gender and the examination of these issues has been a major focus of the Centre’s research programme. The Centre through its research and dissemination has been at the forefront of establishing that children are not mini-adults and the research programme has encompassed sick children, ‘normal’ healthy children and elite young athletes. This week the Centre is hosting for the second time the world’s most prestigious paediatric conference, the International Symposium of the European Group of Pediatric Work Physiology, where the latest world-wide research on many of the lines of enquiry initiated in the Centre will be presented. 25 years on and paediatric exercise medicine has been firmly established as a major research topic around the world and the Centre has helped to keep the issue of children’s health and exercise in the public eye. Our research has time and time again shown that children respond to exercise in a different manner to adults, that physical activity is essential for healthy growth and maturation and that obesity is simply the result of consuming more energy than you burn up. Looking back as we celebrate our first quarter of a century we must thank the over 5,000 westcountry children who have willingly given their time, blood, sweat and energy to make the research possible and their laughter to make it in enjoyable. Great progress has been made: we now know a great deal about how the young body responds to exercise and understand the importance of physical activity on child and adolescent health. However, child obesity is at an all-time high and society seems unable to find a way to translate the scientific findings into practical solutions. We know that our children need to be more active, but how can we get them away from their televisions, their computers and their smart phones and onto the football pitch or running track or simply out into the playground? The Centre’s challenge for the next 25 years is to embrace new technologies and pursue innovative research programmes in paediatric exercise medicine with the objectives of enhancing further understanding of the exercising child and promoting young people’s health and wellbeing. This entry was posted in news, Uncategorized and tagged cherc, children, exercise, health, medicine, paediatric, physiology, research on 23rd Sep, 2011 by rwfm201.